Acrylics Anonymous, Issue #070 -- Multicultural Us - The Feelgood Edition. 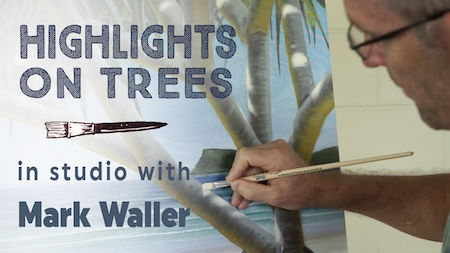 This quick tip from Mark's studio today walks you through the process of creating gorgeous, realistic highlight effects on branches and trunks. Click here to access this short video. Our Explore Acrylics family stretches further than we would’ve ever imagined. 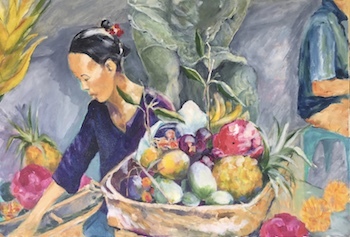 No matter where we come from, all of us are intrigued and inspired by this experience of life enough to want to paint. Our tip this month, is just a reminder that we’re all part of a wonderful community, and that we should support each other, be kind to each other, and this amazing planet so that we can keep painting for as long as we can. We love you all! Always wanted to know the tips and tricks to working on commission? Read on, with our latest webpage. Read on for more info about working on commission. Prominent Youtube tutor and self-taught artist from the Phillipines opens up in our interview this month. Click here for an insight into John's world. 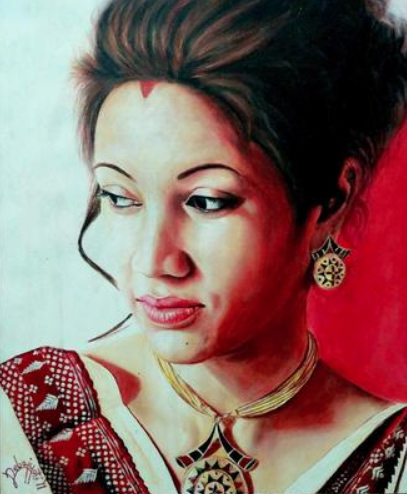 This month we're featuring Debojyoti Boruah's work, from Assam, India, titled "Indian Women". Debojyoti chares some insight into working with acryics over oils. Well done Debojyoti! 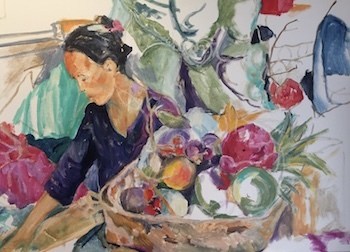 Click here for more on Debojyoti's work, "Indian Women"
Watch artist Darel Carey "dimensionalize" with tape - a time lapse art installation you won't want to miss! 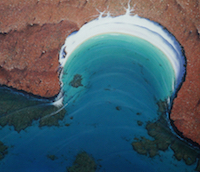 Click here to watch Darel's mesmerising work. Dean McRaine is a potter with a difference. Thought you might enjoy this video of his process of making "psychedelic clay". Awesome! Click here to see Dean's elaborate claymaking process. 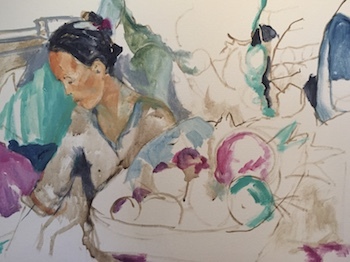 This month's story comes from another of our fellow Lennox Arts Collective members, colour lover Christine Read. 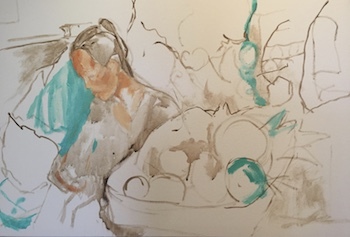 This is the progress of an acrylic painting inspired by a photo I took of a woman at a market stall in Ubud, Bali. She impressed me by her air of quiet calm and her beauty. It was important for me to convey this in my painting. The start as nearly always for me, especially if people are portrayed, was a raw umber ‘drawing’ with very watery paint. I just want to get in the main features and to indicate the composition. I tried to show some of the tones, and started to add a bit of colour. 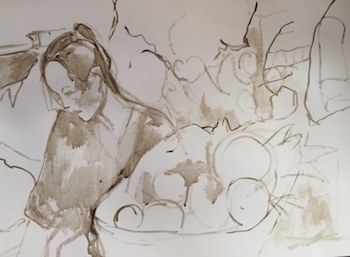 I have not put in the whole scene - I really knew that I would be adding and removing details when I moved ahead - what was important was the woman, her fruit and the Hindu statue behind to give the work a sense of narrative and context. I worked principally on the fruit and decided that there needed to be more - after all it is an artwork and you do have artistic licence! 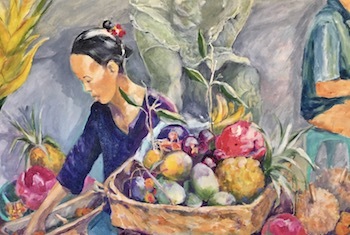 I have a tendency to pop up colour, as I love it so much, and the fruits look so delicious - I also added in some leaves and blurred the statue behind when I felt it was becoming too intrusive. Initially there were various bags and boxes and baskets, but I decided that they were unnecessary so I painted them out using Paynes Grey and white, but allowed some of the previous colour to come through - that does tend to be part of my process and I think it lends some movement to the otherwise ‘dead’ spaces. I also added in shadows as it was quite a bright morning and that helps to give a more 3D ‘feel’. Overall I use a pretty loose style and an ‘active’ pallete (everything is on the pallette at once), so there are always some odd colours picked up by accident to give some vibrancy to the work - I usually mix colours on the brush and in the painting, not on the pallette. I hope you enjoy this little run through my work in progress! Thanks so much Chris, for sharing this vibrant journey with us! Christine runs regular workshops and classes out of the Lennox Arts Collective gallery, as well as annual retreats locally and internationally.